Menu 19 – Turkey Curry Extravaganza! Once upon a time you spent hours and hours preparing a meal. You planned ahead and finished on time. The turkey was moist, your house smelled divine. And then you couldn’t stand another second of that sage/celery smell, yet your refrigerator was still “brimming with goodness.” What to do? In my world, the day after Thanksgiving is Curry Day. Go to a different country, change up the flavor profile, and minimize your time in the kitchen. Turkey Curry with all the toppings #FTW! This curry recipe doesn’t even pretend to be authentic, but it is tasty. Think of this as a method, or 9 steps to goodness. Prepare rice, white or brown, your choice. While the rice cooks, heat up a couple of tablespoons of vegetable oil in a large sauté pan. Dice an onion and gently sauté it in the oil for about 5 minutes. Mince 2 garlic cloves and a tablespoon of ginger. Add your garlic, ginger and 2 – 3 teaspoons of curry powder to the pan and sauté that for a couple of minutes on medium heat. Add about a cup of your leftover gravy. Pull out that extra box of chicken stock you bought and add a cup until it’s as thick or not as you want it. Add leftover turkey that you’ve pulled apart into bite size pieces. On medium heat, let this simmer for a few minutes. Taste your curry and see if you want to add more curry powder, salt or pepper. Enjoy! To plate, rice/curry/toppings of your choice and BOOM! Dinner my friends, is served. I will admit, this recipe is a bit loosey goosey (technical term), but at some point there are things you make off the top of your head. If you want a more structured approach, try this one: http://www.onceuponachef.com/2012/02/chicken-curry.html just modify the turkey part since you’re using leftovers and not starting with raw. 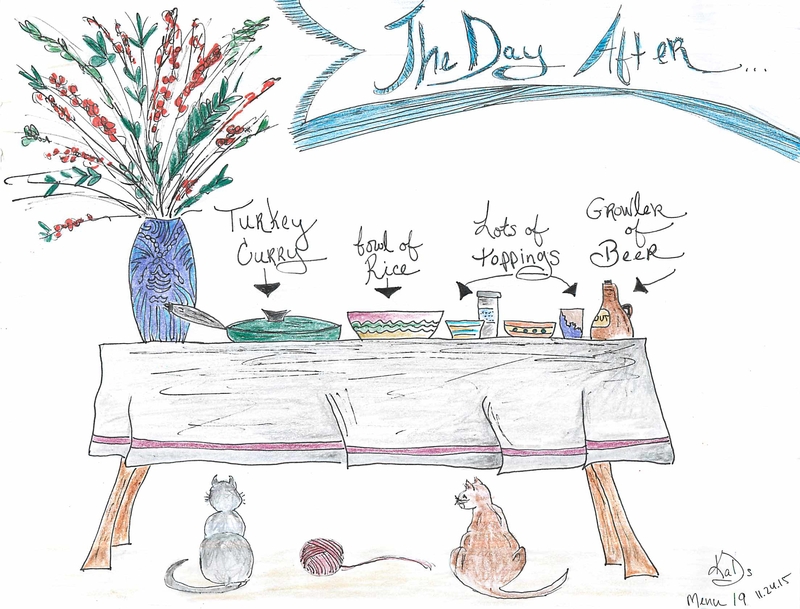 Posted on November 24, 2015 November 24, 2015 by Kylie SachsPosted in easy yet impressive, ThanksgivingTagged cooking, curry, easy entertaining, leftovers, recipes.